It doesn't matter if you're a beginner or PGA Tour pro, taking golf lessons or not, looking to get some of the distance back or add some power that you've always wanted, even if you've never had success with lessons, golf instructional videos, golf flexibility or any other golf game improvement product, with Roger Fredericks Golf Swing Flexibility program, you can finally do something that will help your golf game. Roger's Fredericks program is a 3 part DVD series that lets you customize the program specifically for your abilities. Basing the instruction on your flexibility level will give you more benefit to your golf game faster. By using Roger's golf program for just minutes a day, you'll get more flexible, increase golf flexibility and improve your golf swing faster than any other method you've tried. You'll get stronger, longer and start swinging your golf clubs with effortless power. 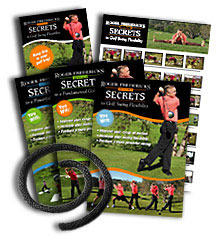 Roger Fredericks Secrets To Golf Swing Flexibility video series will improve the range of motion in your body, and produce a freer and more powerful golf swing, guaranteed! By using Roger's program for just minutes a day, you'll get more flexible and improve your golf swing faster than any other method you've tried. You'll get stronger, longer and start swinging your golf clubs with effortless power. This programs includes the Secrets to Golf Swing Flexibilty, plus 2 FREE videos, Secrets to a Fundamental Golf Swing and Secrets to a Powerful Golf Swing. Also included are the poster and a take along booklet! If you have any questions regarding the Roger Fredericks Secrets To Golf Swing Flexibility, please give us a call, we would be happy to help you with any questions you may have. Write an online review on the Roger Fredericks Secrets To Golf Swing Flexibility, and share your thoughts with others.